Now is the time to think about installing new windows. Today’s new energy efficient alternatives make replacing your home’s current windows a smart choice no matter the season. New windows help keep your home’s heating and cooling expenses to a minimum, increase your home’s value, and boost the aesthetic appeal of your property. Suffolk County Gutters has a wide range of experience when it comes to window installation. From standard size windows to custom windows, our knowledgeable team will make sure that each window gets installed properly the first time. Improperly installed windows will be less energy efficient and can lead to other issues as well, such as cracked joints, exposure to the elements, and permanent damage from accumulated moisture. Suffolk County Gutters are masters at window installation. 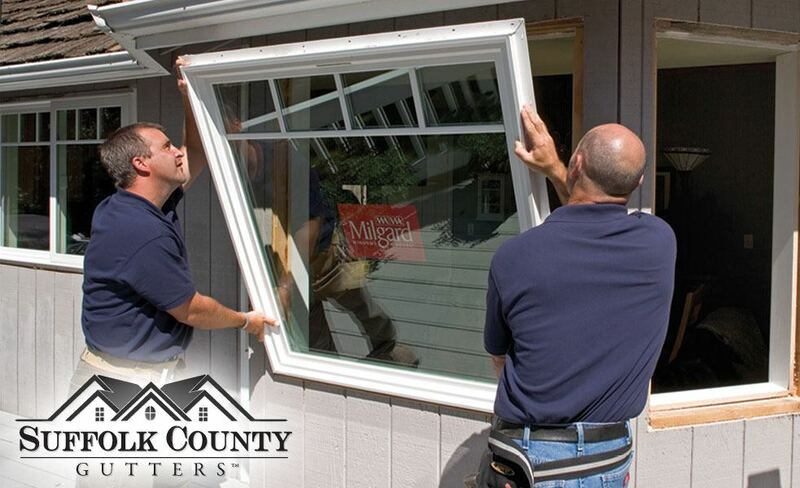 Your windows, no matter their size or style, will be installed correctly. Period. From double hung to bay, picture and casement, our combination of knowledge and experience will give you the confidence that your installation will go smoothly from start to finish. Professional service and only the best customer service, we are ready to help you with your next window installation project! Give us a call today for a free consultation and estimate!